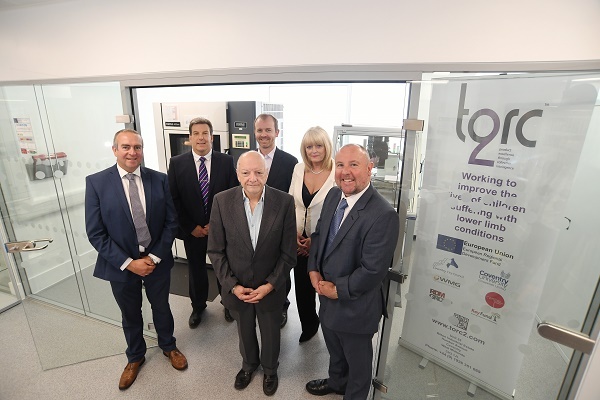 Torc2 Ltd, based at the Bilton Industrial Estate, has created a new, world-first form of plastic that could revolutionise the way limb conditions and injuries are treated. The company has protected the Intellectual Property (IP) on the material as well as a new process method using their flexible, durable compound that can be re-shaped at temperatures safe for patients. Gary Blundell and Ron Taylor, who are part of the team that runs the firm, have a background in engineering and plastics and originally developed the new material as a potential replacement for Plaster of Paris casts. But after seeking opinion from the medical profession including surgeons at University Hospital Coventry & Warwickshire, the pair turned their attention to devices such as splints and supports for the treatment of Cerebral Palsy, Talipes (club foot), Hip Dysplasia, Idiopathic Toe Walking and liners that can be reshaped for lower limb prosthetics. Gary added: "We've also been supported by Warwick Manufacturing Group with trial production and have had significant help from our friends at RDM Group." Coventry City Councillor Jim O'Boyle, cabinet member for jobs and regeneration, said: "Coventry has always innovated and this is yet another example of a local business being at the cutting edge of new developments. I hope it leads to the on-going growth of the company and opportunities for local people." The company sought help from the CWLEP Growth Hub to assist in raising finance for its product development and was then referred to Coventry City Council which resulted in being awarded a grant under the Coventry & Warwickshire Innovation Programme - partfunded by the European Regional Development Fund. Torc2 is the first SME to be awarded a grant through the programme. altered to exactly fit the patient very quickly, easily and without waste. "In some cases, Spica casts being a typical example, it can cut out the need for extra trips to the operating theatre - which is a huge cost saving to the NHS and much better for the patient." "The next phase is to upscale the current lab micro 3D printing process to enable production of full size devices for clinical trials. Feedback we are getting is that this is a very exciting new material that has the potential to revolutionise the way in which this area of treatment is delivered." The Innovation Programme supports Coventry & Warwickshire SMEs to develop innovative products and services which are new to the market. If you are interested in the programme please email us at innovation@coventry.gov.uk.